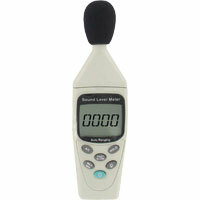 Model SM-100 Digital Sound Meter is ideal for measuring noise levels from 30 to 130 dB with accuracy of ±1.5 dB. Model SM-100 has a frequency of 31.5 Hz to 8 kHz, three different dB ranges, and a 1/2" condenser microphone. The SM-100 has two frequency weightings: the "A" weighting ranges from 30 to 130 dB, while the "C" weighting ranges from 35 to 130 dB. The four digit LCD backlit display has the ability to update in 0.5 seconds when the unit is set to fast response. Model SM-100 features data hold, ability to record maximum/minimum, auto ranging, auto power-off, and a dynamic range of 50 dB. The compact size of the SM-100 makes it very easy to operate and store. Each unit includes battery, carrying case, black foam cover to protect the sensor, and instruction manual. The SM-100 is ideal for technicians measuring and recording sound levels in zones or rooms of buildings, musical halls, theaters and near equipment or machinery on the plant floor. A weighting: 30 to 130 dB; C weighting: 35 to 130 dB. ±1.5 dB (at 94 dB @ 1 kHz). 31.5 Hz to 8 kHz. Operating: 41 to 104°F (5 to 40°C); Storage: 14 to 140°F (-10 to 60°C). Operating: Below 80% RH; Storage: Below 70% RH. Maximum 6562 ft (2000 m) above sea level. 4 digit LCD with 0.5 second update when set to fast response. 9 V alkaline battery, included, user replaceable. 50 hours with alkaline battery (approx). 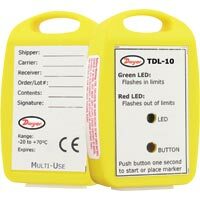 What approved accessories go with the Model TDL-10? A number of approved accessories will greatly contribute to the featureset of the Model TDL-10. Please check the corresponding product page to view the list of available accessories.